Happy Saturday! It has been a while (again) since I have posted, but we have been on spring break here in Georgia and cooking was pretty much non-existent. We took a little trip to Washington D.C. over the break and had a blast! The weather was beautiful and we got to see the pretty cherry-blossom trees. We went to all the monuments, lots of museums, and just enjoyed our time together as a family. Thursday was the first night I cooked in over a week. The girls went to the store with me to help me pick out some meals for the week. Thursday night it was baked shells, which was kind of like this recipe, but with only beef and mozzarella (no ricotta). Last night I made a roast chicken. Tonight I am making a new recipe for pork shoulder; I am planning on using this massive piece of meat a couple of ways, so be on the lookout! 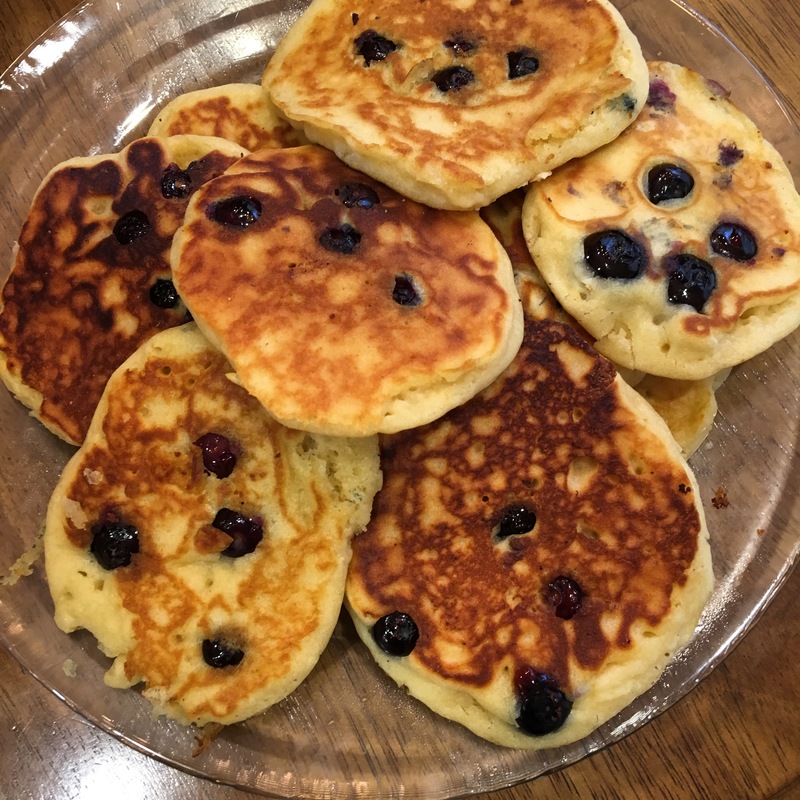 This morning I made these scrumptious blueberry honey pancakes. I took a few different pancake recipes I have made along with some others I have found, and kinda did my own new thing. The girls gobbled them up with a little bit of some blueberry honey reduction sauce (see below). In a large bowl, add the dry ingredients (flour, baking soda, baking powder, and salt)and whisk together until combined. In a separate bowl, whisk together the wet ingredients (oil, honey, milk, and egg). Add the dry ingredients to the wet ingredients and stir together until combined. Don’t overwork the batter, though. A few lumps here and there are just fine. Grease a large skillet or pan with butter or oil over medium heat. Using an ice cream scoop or other easy to pour measuring device, pour about a tablespoon of batter on the griddle and top with blueberries. I usually use about 4-6 on each one, but it depends on how many you have and what size they are. After about 2 minutes, you should start to see bubbles forming on the top of your pancakes. Turn them over and cook for about 2 minutes more.